On Wednesday morning, members of the allochthony working group presented their work during the “Extending freshwater management beyond shorelines by linking aquatic and terrestrial ecosystems” symposium, chaired by Andrew. Mike kicked off the session by describing how the quality of terrestrially-derived foods varies, how these inputs are related to the system’s size, and also how they are increasingly recognized to promote ecosystem stability. In his talk, Chris challenged the classic idea that terrestrial OM is a subsidy, and showed that it may actually negatively affect food web productivity by influencing temperature and light levels (see Kelly et al. 2014 in Ecology). Grace discussed her work on the vertical partitioning of resources in lakes, in which she demonstrated the importance of epilimnetic autochthonous and allochthonous resources for zooplankton (see Wilkinson et al. 2014 in L&O). Andrew essentially reviewed the work done by the group during the Cambridge workshop and highlighting the need to understand how watershed features and lake chemistry may influence terrestrial resource use by aquatic consumers. John focused on ecosystem recovery, and more particularly on the delayed recovery of degraded watershed systems. He presented work done in Sudbury, Ontario, where long-term monitoring programs and extensive ecological studies have been carried out over the past 40 years. Finally, Andrew Farmer, from the Institute of European Environmental Policy (IEEP), delivered a much more management-oriented talk. The main challenges in implementing effective legislation from the EU Water Framework Directive to protect watersheds seem to emanate from the complexity of interactions between terrestrial and aquatic systems, from certain political pressures and from the lack of a solid evidence-based approach to meet specific objectives. This session was by far the most interesting one, right up my stream! Objectively though, the quality of the research and of the presentations truly made this a remarkable session. 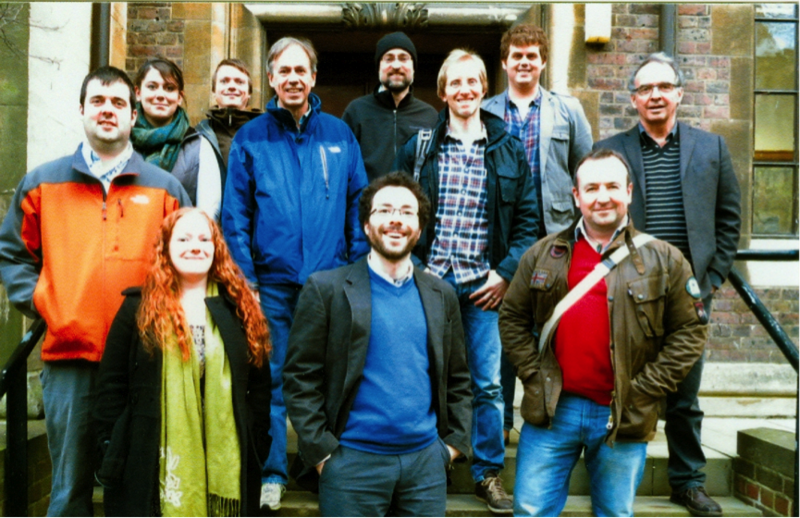 The symposium concluded the Cambridge allochthony workshop well, giving an overview of each member’s research focus. I also attended Peter Beckett’s talk on the “regreening” of Sudbury, Ontario, which is where Andrew, Brian, John, Erik and Joanna set up experiments on allochthony in the past and where I will be spending a few months during the summer as part of my PhD. It was therefore great for me to learn more about the history of this special place from a person who has been actively involved in the ecological restoration of the region – from liming to planting – ever since its beginnings in 1973, and has seen it change under his own eyes. Each morning, the meeting started with a plenary talk. On the first day, Anne Larigauderie, from the Intergovernmental Platform on Biodiversity and Ecosystem Services (IPBES), talked about science-policy frameworks and ways scientists should and can get involved in policy. The second plenary talk had a much stronger focus on ecological theory. It was given by Pedro Jordano, who presented his research on coevolutionary networks and the extinction of interactions resulting from anthropogenic disturbances. The third talk was delivered by the famous blogger GrrlScientist, who successfully summarized 12 months of ecology in 30 minutes. Finally, Camille Parmesan concluded the plenaries, placing ecology in the context of rapid global change, and discussed how to identify novel solutions, and the risks associated with them, to the numerous problems emerging from it. The four talks therefore covered different, but equally important, aspects of ecology: policy, theory, media and scientific challenges in a dynamic world. The conference can be praised for its contemporaneity: questions could only be asked via Twitter during the plenaries. This is understandable considering the amount of participants, however I believe this method may be less anonymous than raising hands, and therefore may bias which and whose questions are answered. Some food for thought for the future of large scientific events… With 12 sessions occurring at a given time, it was slightly overwhelming and often difficult to choose which talk to attend. From marine metagenomics to macroecology and biogeography, and from the Rocky Mountains to Bornean tropical forests, a great variety of topics were discussed. As one may expect from the French, the food was exceptionally good, with mini croissants and pains au chocolat served at coffee break every morning, and fromage and waffles with wine and local Northern beer for aperitif. A highlight of the meeting was also to see hundreds of ecologists Ceilidh dancing to a live Irish folklore band during the gala. Additionally, Lille is a small city with a rather charming center, and the conference was a short walk from the “Vieux-Lille” and its old, paved streets and lively Christmas market. Overall, it was a highly busy but fascinating week. I feel lucky to have spent time in the company of researchers whose work I admire so much and that I reference on a regular basis. Merry Fishmas and Happy Yew Year from the Ecosystems and Global Change group! ← What have we been learning about the Cerrado?